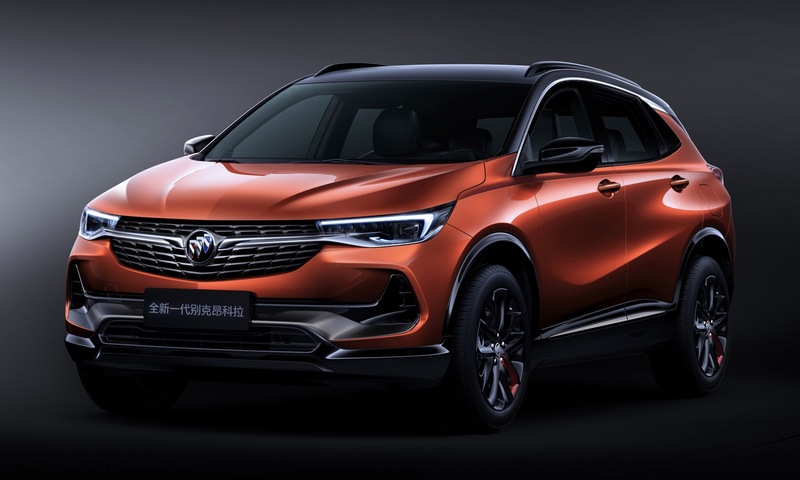 As expected, General Motors has just revealed the all-new Buick Encore family of small crossovers in China ahead of the 2019 Auto Shanghai show. Despite both B-segment models wearing the Encore name, these are two very different vehicles from a mechanical perspective. While both second-gen Encore models will be available in China, only one is expected to make its way to the United States. The “Encore” is based on GM’s Global Emerging Markets architecture (GEM platform) intended for developing markets. We expect this model to be sold exclusively in China. Meanwhile, the Buick Encore GX is based on GM’s VSS-F platform. Though GM China describes the Encore GX as a “long wheelbase” variant of the Encore, the two models have little in common, besides the name. The Encore GX is the model that we expect will be sold in North America. GM says that both Encore models will cradle eighth-generation Ecotec engines and will offer a choice of the new GM 9-speed automatic Hydra-Matic transmission or a new continuously variable transmission (CVT), without providing displacement, power, or torque figures. Compared to the first-generation Encore, both the new Encore and Encore GX offer “highly efficient power with decreased fuel consumption and emissions”, which enables them to meet China’s 6-B emission standard. No further details are available at this time, so subscribe to GM Authority (it’s free) as we follow this developing story, as well as for more Buick Encore news, Buick news, and 24/7 GM news coverage. Harrison – your conclusions are premature. You really have to see the GX from different angles and in different colors, and in the real world. It looks significantly better than the non-GX Encore. We’re working to get more photos of both. Stay tuned. Thanks Alex. I’m hoping you’re right and more photos prove me wrong. At the end of the day though, this is still an upgrade over the existing model. I’d like to learn more about GEM. I know it’s Gamma-based meaning that one day it could theoretically be Federalized and sold in the US if one of it’s vehicles were needed in a pinch to fill a niche. It’s amazing how many platforms GM invests in. FCA would simply make modifications with Krazy Glue and call it a day! Hang on for real world photos. GM’s photo shopped photos are horrible and seldom do the new models justice. Just as the CT5 the shopped photos looked like a Saturn but the real world really makes the car pop. Even then In person really let’s them show what they really are. The CT6 looked horrible in the first shots but in later photos and real world it is very good looking. I kind of agree with Harrison above. I kind of like the top (orange-ish) pic a little better than the bottom (blue) pic. It seems to look like the more expensive one. On the surface, there seems to be hardly any difference in the new Encore and Encore GX. But the article informs us that the Encore GX, which is the one coming to the USA, has a longer wheelbase and is very different mechanically from the Encore, which will only be offered in China. To my eyes, the photo of the blue Encore GX looks more upscale and refined, including more chrome accents on the front end and a chrome roof rack. I bet the Encore GX’s interior (and the armrest) will be a step up from the present Encore and it looks like there’s more legroom in the back seat of the GX. Maybe GM will even offer an Encore GX Avenir, which will further push it above the other model. So they made it a little bigger so that they could charge more money for it. Don’t these douchenozzles understand that some people actually need smaller cars for their city garages?!? For those who don’t — introduce a slightly bigger vehicle. How much they can increase the size and price of the new Encore GX will be limited by the Envision and the upcoming E2-based model (Buick’s XT4). The GEM-based, non-GX Encore is being introduced to reach an even lower price point in China, since Buick is kind of a mainstream brand in China. All in, I don’t expect the positioning (size/price) of the Encore GX to change much over the current first-gen model in the US. I wish we could get the Encore GX in the U.S. It looks better and is cheaper..
You mean the non-GX Encore, right? The GX is what we currently expect to see in North America. Yes, I meant the non-GX. Alex, would the be any chance we could see both variants here in the states? From what we currently know, the non-GX Encore is not planned for US or Canada (though it might come to Mexico). That said, there is no reason they can’t change this, but GEM-based models were not developed with US safety standards in mind. The non-GX Encore is a Chevrolet Tracker (also a MG ZS ?). The GX Encore is a Chevrolet Trax. The MG ZS is sold in Australia, so there don’t appear to be any safety or compliance issues with the model. I think the thing looks pretty good. I hope ours will look as good as this does too. I find it interesting that the GEM platform one might come to Mexico, but does not conform to US safety standards. Mexico being on our doorstep and as much back and forth as there is I’m sure some will be travelling here and Ha Ha Ha not up to “code”. Bring to the US AS IS. that’s a good looking Buick. The 2020 Buick Encore looks more upmarket that the current Buick; but what’s underneath the sheetmetal is important as the market segment of the Buick Encore is expanding and has more competition than ever which means unless Buick has address concerns like fun-to-drive needs.. Buick may see sales slip despite the revamp. I don’t dislike the GX. If they interior is a knockout, that could actually be worthy of the Buick badge.